Great Audi Q5 car Leasing & Contract Hire Deals. Our Audi Q5 Lease Deals. The second generation version of Audi's Q5 premium compact SUV might not appear to be much different from its predecessor but take it from us: almost everything that could have been improved on this car has been. There's sharper looks, extra technology and more efficient engines that have reduced running costs. Audi, you see, doesn't do things by halves. Some things haven't changed though. As before, this is the kind of compact SUV you buy if, rather unreasonably, you want something with mastery of the mud as well as the motorway. Something that'll look great in the driveway, keep you mobile in a snowy snap and shrink around you when a twisting road opens up ahead. It's a demanding brief that nearly half a million global owners felt was achieved by the original version of this car. But is this latest generation version good enough to take on tougher rivals that promise much the same thing? That's what we're going to find out. Most Q5 customers will want the 190PS 2.0 TDI diesel engine, but low mileage owners shouldn't discount the much improved 252PS 2.0 TFSI petrol unit. You can also talk to your Audi Centre about a 286PS 3.0 TDI six cylinder diesel too. And at the top of the range, the sporting SQ5 variant now switches to petrol power, offering a potent 354PS 3.0 V6 TFSI unit. 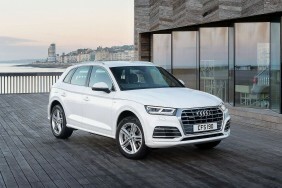 The drivetrain of the second generation Q5 has been redeveloped from the ground up - take the revised six-speed manual transmission and the more efficient seven-speed S tronic auto 'box for example. The standard quattro 4WD system is improved too, using Audi's 'ultra' technology to always disengage the rear-axle drive whenever it isn't needed: if necessary, the system can then proactively re-engage it. The most poweeful variants can be ordered with an optional sport differential at the rear axle which distributes torque between the wheels for sharper handling. And all models get Torque vectoring for extra cornering precision. Dynamically, Audi has tried to make this Q5 feel sporty yet extremely comfortable. Creating the basis for this are the newly developed five-link suspension set-ups and also the new electromechanical power steering system. Choose a model with adaptive damping and you'll be able to tailor the ride quality via the various settings of the standard 'Audi drive select' vehicle dynamics system. You can do the same thing with the even more sophisticated adaptive air suspension package that's available as an option. Those venturing 'off piste' will be interested in the two new settings added to the 'drive select' set-up - 'lift/offroad' and 'allroad'. The price positioning of this second generation Q5 hasn't changed very much, so most mainstream models will continue to sell in the £37,000 to £41,000 bracket. There's the usual choice of 'SE', 'Sport' and 'S line' trim levels. This time round, the key option is the 'Audi Virtual Cockpit' a 12.3-inch screen that completely replaces the dials in the instrument binnacle. The MMI terminal in the centre console acts as the main control element. In the top infotainment system, the optional MMI navigation plus with MMI touch and an 8.3-inch display, a touchpad is integrated into the rotary pushbutton. Many Q5 owners will want to order the upgraded 'multi-fuction steering wheel plus' and some may also want the optional Head-up display. The Audi navigation system will also be popular, the latest set-up able to 'learn' your regular routes and suggest optimised planning for your next trip. As ever with an Audi, media connectivity will be key to many customers. 'MMI navigation plus' uses the 'Audi connect' module to integrate a LTE module and a Wi-Fi hotspot. And a free 'Audi MMI connect app' allows you to monitor your car from your 'phone. You can connect in your handset via the 'Apple CarPlay' or 'Android Auto' systems - and boost its reception via the optional 'Audi phone box' feature. Kids will like the 'Audi tablet' system which provides for rear seat entertainment. This second generation Q5 has taken a big step forward in terms of efficiency, thanks to a 90kg weight saving over its predecessor. This comes mainly courtesy of the fact that steels with maximum tensile strength and aluminium form an intelligent material mix in the body. It also helps in this regard that the MK2 model Q5 stands at the top of its class in its aerodynamics. The four-cylinder versions attain a cd figure of 0.30 with the aerodynamically optimised roof. As a result, even the petrol engines return surprising good running cost figures. The freshly re-developed 2.0 TFSI unit, for example, manages up to 41.5mpg combined, which equates to 154 grams CO2 per km. And residuals? Well, trying to buy a used Q5 is quite a depressing experience as they cling onto their value with some tenacity. This is great news for the new buyer and part of a trend certain to continue with this MK2 model. After the usual three year / 60,000 mile ownership period, expect it still to be worth around 45% of what you originally paid for it.